Gray wedding suits There are 44 products. 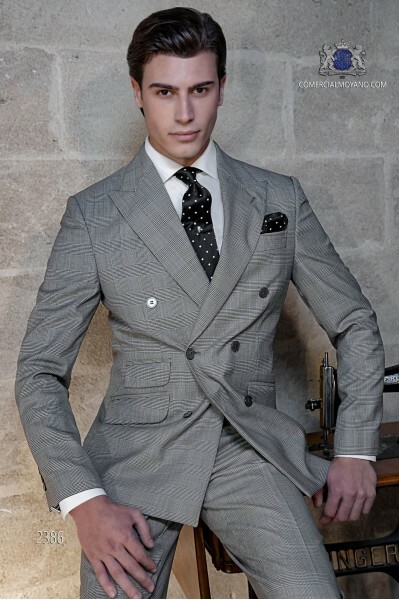 Italian diplomatic royal grey suit with classic lapel, 2 mother-of-pearl buttons and two openings. Diplomatic mixed wool fabric. Tuxedo Wedding suit 2378 Gentleman Collection Ottavio Nuccio Gala.Coordinated with a straight vest of the same fabric, 5 pearl mother buttons. 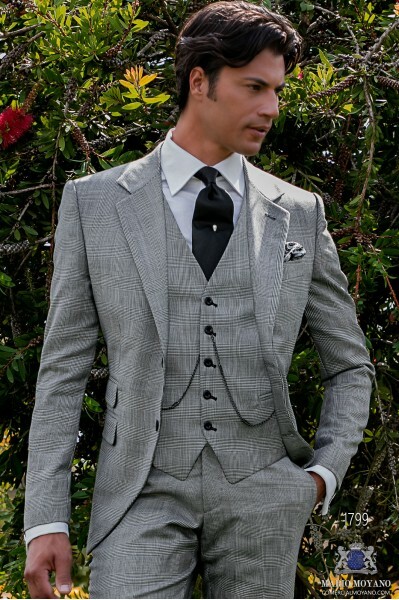 Italian bespoke Prince of walles double breasted suit with wide peak lapels, 6 mother of pearl buttons and double vent. 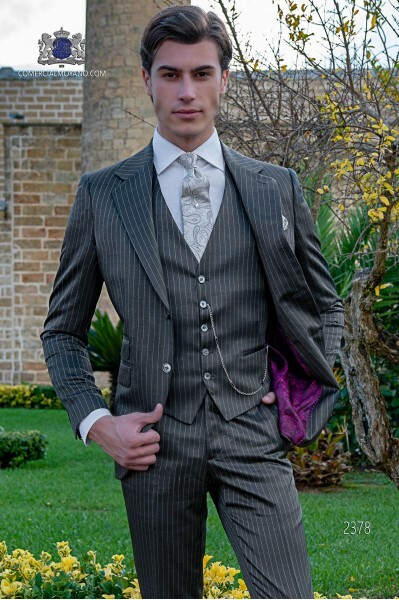 Wedding suit 2143 Gentleman Collection Ottavio Nuccio Gala. 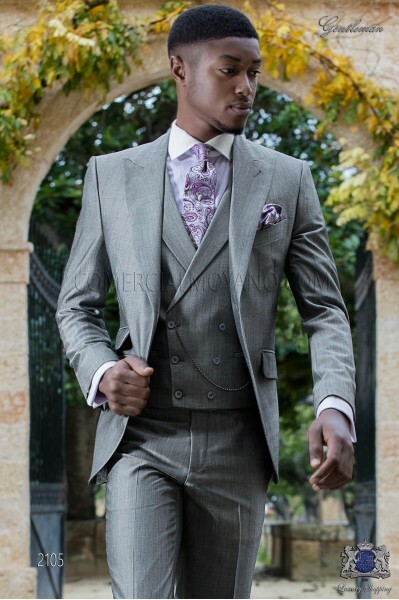 Tailored light gray Italian suit with pointed flap, match and two openings in "Prince of Wales" wool mixed fabric. Tuxedo Wedding suit 2360 Gentleman Collection Ottavio Nuccio Gala.Coordinated with black crossed trousers and waistcoat with shawl lapel and 6 corozo buttons, red satin tie and pure silk handkerchief. Tailored Italian suit with classic lapel, 2 corozo buttons, match and two openings in mixed wool fabric "Prince of Wales". Tuxedo Wedding suit 2357 Gentleman Collection Ottavio Nuccio Gala. Coordinated with matching waistcoat Welsh vest with shawl and 6 corozo buttons, red satin tie. Italian bespoke grey morning suit with wide peak lapels and 2 corozo button. Prince of Wales wool mix fabric. Tuxedo Wedding suit 2390 Gentleman Collection Ottavio Nuccio Gala. 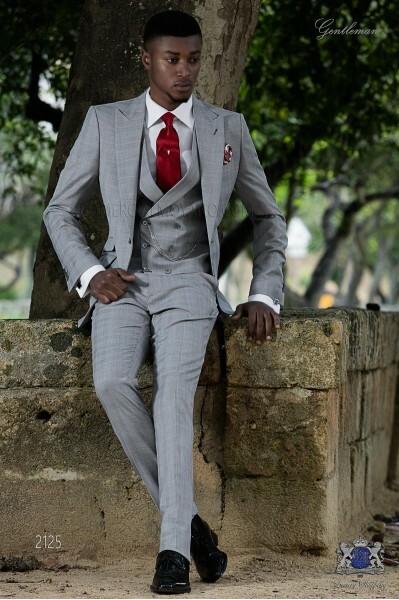 You can complete the outfit with matching waistcoat, double breasted, with shawl collar and 6 corozo buttons, red tie with Scottish box and white linen pocket square. 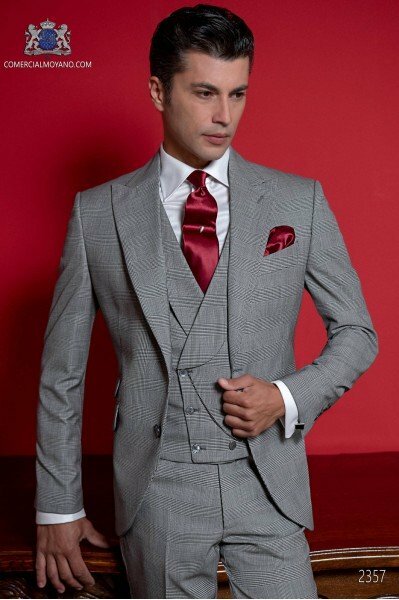 Italian bespoke grey and red suit with wide notch lapels, 2 mother of pearl buttons, ticket pocket and double vent. Prince of Wales wool mix fabric. 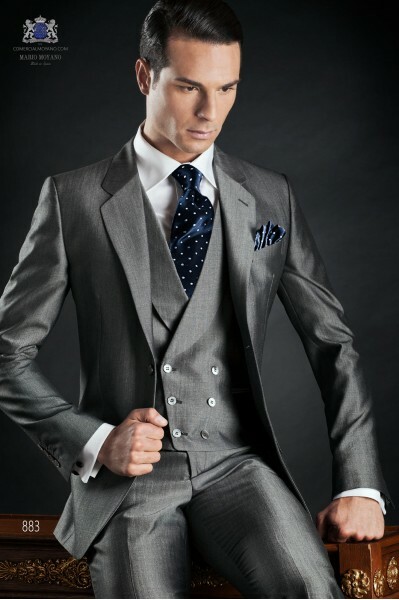 Wedding suit 2124 Gentleman Collection Ottavio Nuccio Gala. You can complete the outfit with matching “Prince of Wales” waistcoat, double breasted. Italian bespoke light grey suit with wide notch lapels, 2 corozo buttons, ticket pocket and double vent. Prince of Wales wool mix fabric. Wedding suit 2125 Gentleman Collection Ottavio Nuccio Gala. 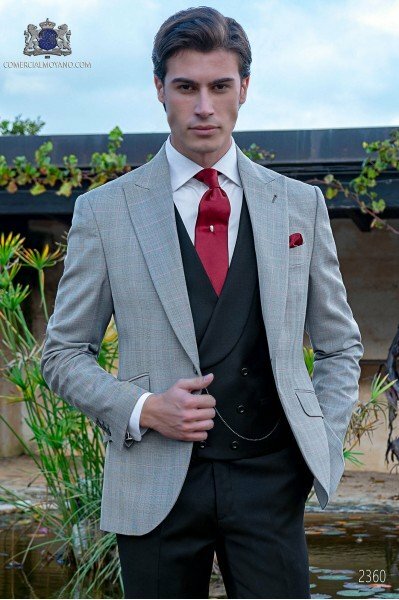 You can complete the outfit with matching “Prince of Wales” waistcoat, double breasted, with shawl collar and 6 corozo buttons, red satin tie and pure silk. 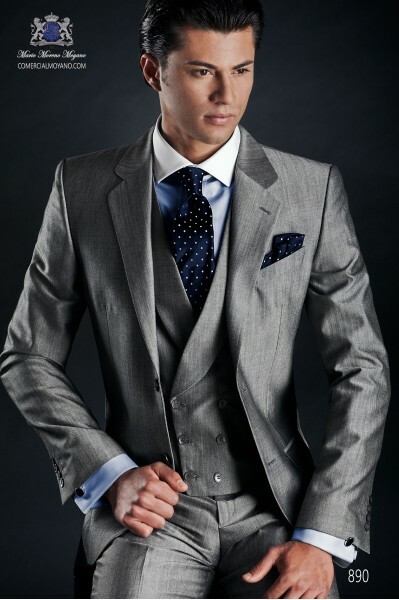 Italian bespoke light grey and blue suit with wide notch lapels, 2 buttons, ticket pocket and double vent. Prince of Wales wool mix fabric. Tuxedo Wedding suit 2396 Gentleman Collection Ottavio Nuccio Gala. You can complete the outfit with matching “Prince of Wales” waistcoat, double breasted. 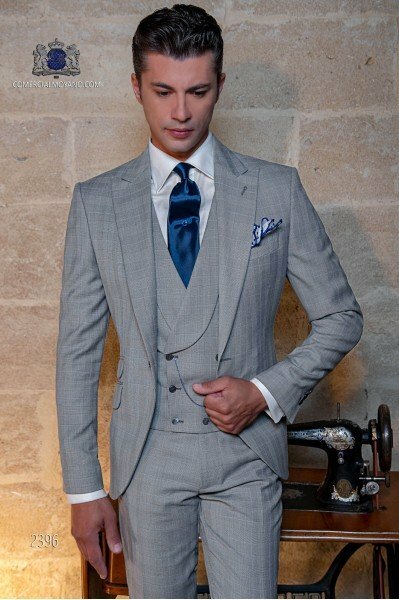 Italian bespoke light grey and blue suit with wide notch lapels, 2 buttons, ticket pocket and double vent. Prince of Wales wool mix fabric. 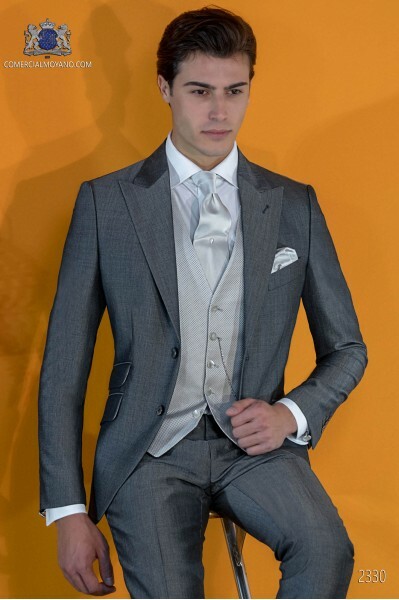 Wedding suit 2112 Gentleman Collection Ottavio Nuccio Gala. You can complete the outfit with matching “Prince of Wales” waistcoat, double breasted. Italian bespoke grey suit with wide notch lapels, 2 mother of pearl buttons, ticket pocket and double vent. Mohair wool mix alpaca fabric. 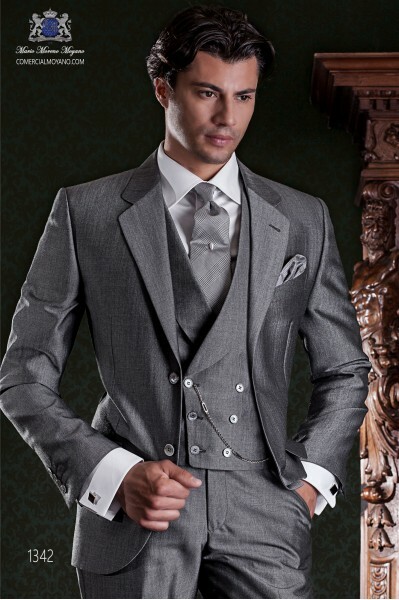 Tuxedo Wedding suit 2367 Gentleman Collection Ottavio Nuccio Gala.You can complete the outfit with matching grey waistcoat, double breasted. Italian bespoke pearl grey suit with wide peak lapels and 1 mother of pearl button. Mohair wool mix alpaca fabric. Tuxedo Wedding suit 2332 Gentleman Collection Ottavio Nuccio Gala. 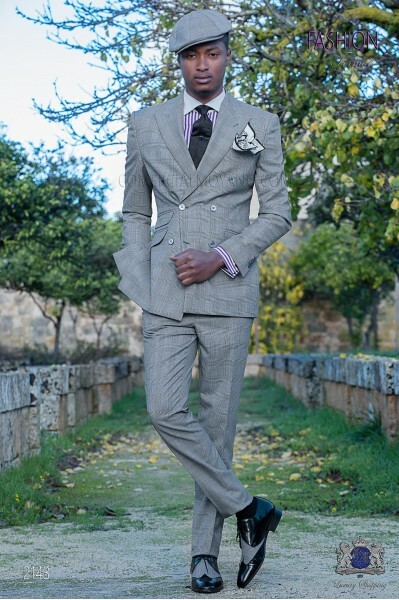 Italian bespoke pearl gray single breasted suit in new performance wool-alpaca fabric, with 2 buttons, style 890 Ottavio Nuccio Gala, Gentleman collection. 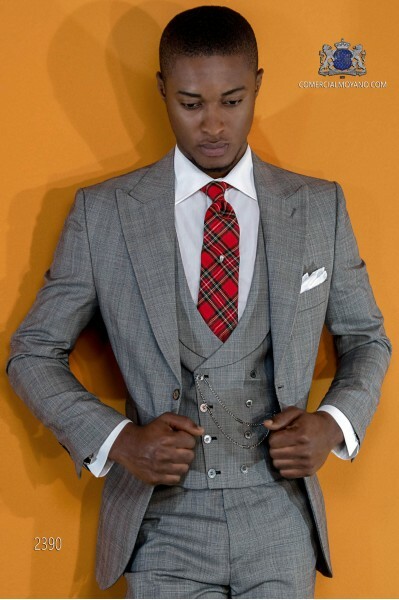 Italian bespoke light grey suit with wide notch lapels, 2 buttons, ticket pocket and double vent. Mohair wool mix alpaca fabric. 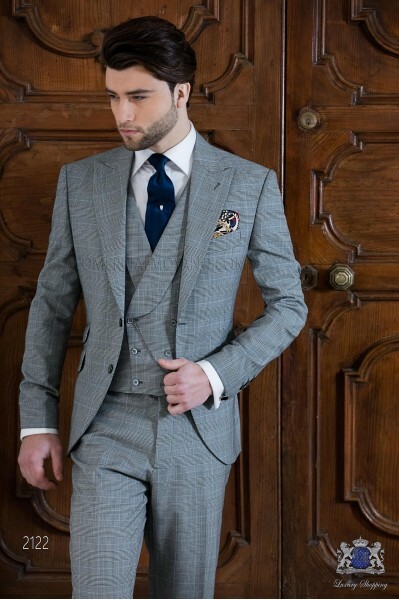 Wedding suit 2105 Gentleman Collection Ottavio Nuccio Gala. 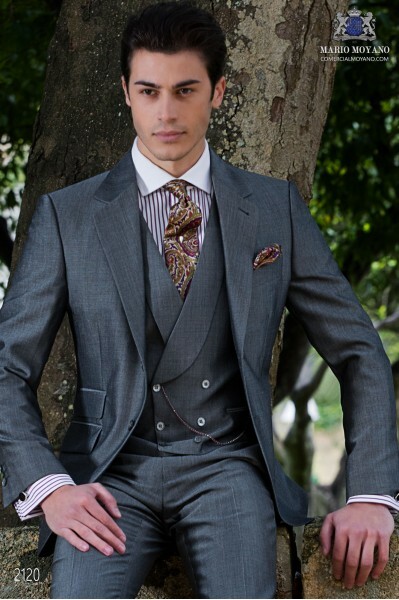 Italian bespoke grey suit with wide peak lapels, ticket pocket and double vent. Mohair wool mix alpaca fabric. Tuxedo Wedding suit 2330 Gentleman Collection Ottavio Nuccio Gala. 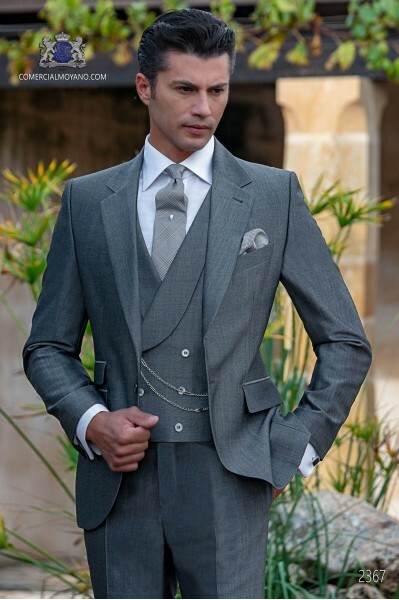 Italian bespoke gray suit with wide notch lapels, 2 mother of pearl buttons, ticket pocket and double vent. Mohair wool mix alpaca fabric. 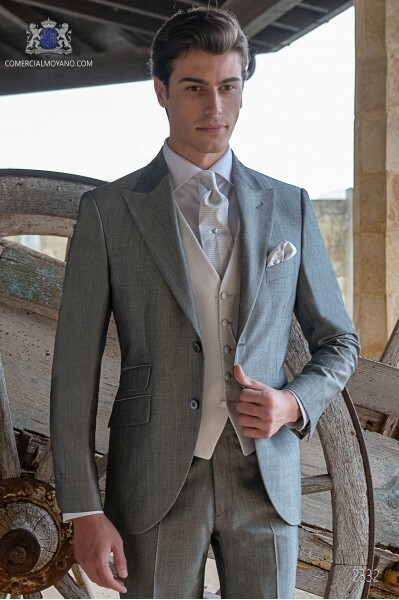 Wedding suit 2120 Gentleman Collection Ottavio Nuccio Gala.You can complete the outfit with matching grey waistcoat, double breasted, with shawl collar. 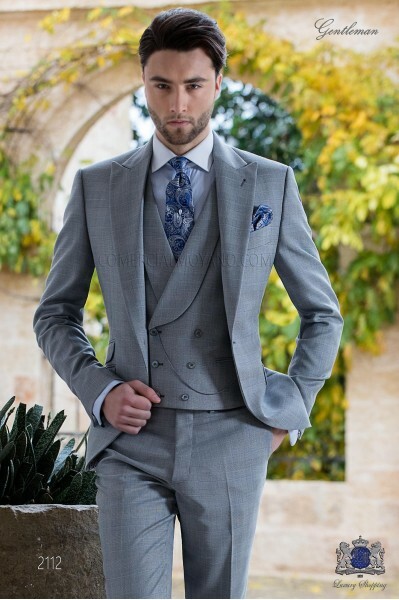 Italian bespoke single breasted suit, 2 buttons, in new performance fabric, gray mix wool mohair, style 883 Ottavio Nuccio Gala, Gentleman collection. Italian bespoke anthracite grey suit with wide peak lapels, 2 mother of pearl buttons, ticket pocket and double vent. Wool mix fil a fil fabric. 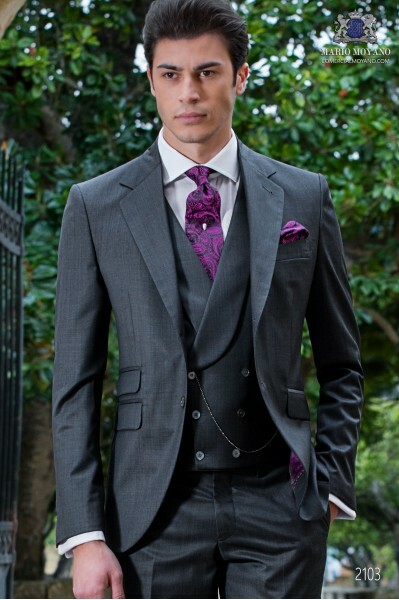 Wedding suit 2103 Gentleman Collection Ottavio Nuccio Gala.